Researchers from the SLAC National Accelerator Laboratory have demonstrated a new X-ray technique, called stimulated X-ray Raman scattering, which tells scientists about the energy flow and other properties of individual atoms and elements in a molecule. Researchers have found a new way to probe molecules and atoms with an X-ray laser, setting off cascading bursts of light that reveal precise details of what is going on inside. The technique may allow scientists to see details of chemical reactions and home in on the properties of specific elements within complex molecules in a way not possible before. The experiment at SLAC’s Linac Coherent Light Source demonstrated a new X-ray technique, called stimulated X-ray Raman scattering, in which samples absorb X-ray light and then emit it at a slightly different energy. The difference between the energy going in and the energy coming out tells scientists about the energy flow and other properties of individual atoms and elements in a molecule, which may ultimately reveal the earliest details of chemical reactions. In the LCLS demonstration of this technique, reported December 5 in Physical Review Letters, intense X-ray laser pulses triggered a chain reaction that greatly amplified the X-ray signal, which normally is faint and difficult to detect. In the experiment, conducted in August 2011, researchers hit compressed neon gas with X-ray laser pulses, which caused electrons to move out of their positions close to the atomic nucleus and into open outer energy shells. When the electrons fell back into place, they slightly rearranged and spewed X-ray light at a slightly different energy. 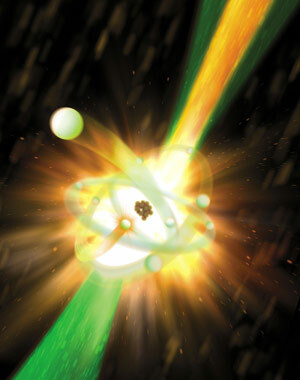 The emitted X-rays triggered a chain reaction of light bursts in neighboring atoms. All of these amplified X-rays were emitted in the same direction, making it easier to measure their energy. The experiment builds upon an earlier effort at LCLS to create an “atomic laser” using a similar amplification effect. SLAC’s John Bozek, an LCLS staff scientist who participated in the experiment, said the technique is particularly useful for lighter elements that are difficult to measure using other X-ray techniques, and for studying how specific elements react to X-ray light. Earlier forms of Raman scattering, which typically use visible, infrared or ultraviolet lasers, have many applications, Bozek said, including the study of batteries in action, catalysts at work in chemical reactions and electronic processes in exotic materials. X-ray lasers such as LCLS could bring a new level of precision to such studies by allowing researchers to focus on specific atoms and elements involved in a reaction and explore never-before-seen ultrafast chemical changes. Researchers also note that the technique might be used to explore complex processes at work in a light-driven chemical process such as photosynthesis, or to study a catalyst-driven chemical reaction triggered by laser light. The new technique could also possibly be used to study crystallized forms of biological proteins, she added. Her team is returning to LCLS in February for experiments that use multiple X-ray pulses of different wavelengths, or “colors,” to better control and tune the X-ray scattering process. They also plan to study the timing of X-ray-triggered changes in molecules. Other participants in the research were from CFEL, SLAC, Max Planck Institute for the Physics of Complex Systems in Germany, Colorado State University and Lawrence Livermore National Laboratory. Be the first to comment on "Researchers Discover New Way to Probe Molecules and Atoms with an X-Ray Laser"